In the bowl of a kitchen mixer, such as a KitchenAid fitted with a paddle attachment, add the sugar and oil. Mix on low until well incorporated. Add the eggs and molasses. Slowly add the flour, followed by the baking soda, cinnamon, ginger and salt. Mix well. Place a generous amount of sugar in a shallow bowl and place by your work station. Using your hands, gently roll the dough into 1-inch balls. Roll the balls in the sugar-coating evenly. Place on the prepared baking sheet and repeat with the remaining cookie dough. Be sure to leave about 2 inches between the cookies to allow for spreading. Bake for about 9-10 minutes until just set. Note: If you plan on dipping or drizzling the cookies with chocolate, allow them to cool completely before doing so. 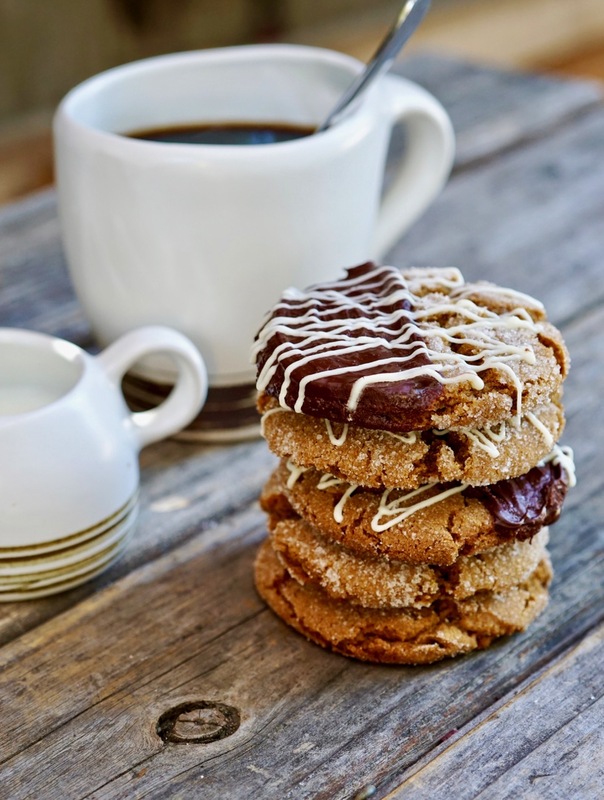 For dipped ginger snaps, place the chocolate chips and butter in a small microwave safe bowl. Heat slowly in 30 second intervals until melted. Mix well to incorporate. Dip half of the ginger snap into the melted chocolate and place back on the baking sheet. Repeat with the remaining cookies. 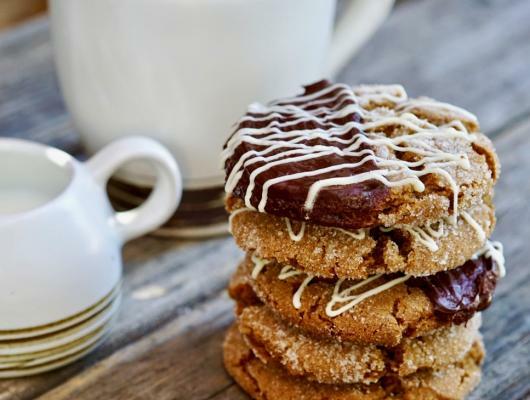 For drizzled ginger snaps, place the white chocolate chips in a small microwave safe bowl and heat slowly in 30 second intervals until melted. For best results, make a small parchment paper pastry bag (see link above) to help drizzle the melted chocolate in a criss-cross pattern over the cookie.